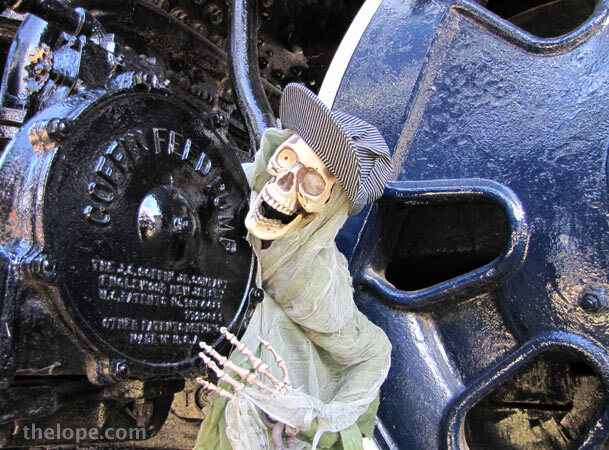 Your friendly neighborhood corpse checks out a Coffin feed pump. 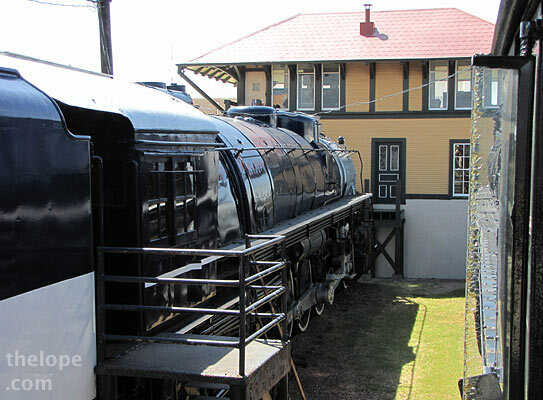 The pump was part of the circulation system of steam locomotive Frisco #4501 now on static display at the Museum of the American Railroad in Dallas. 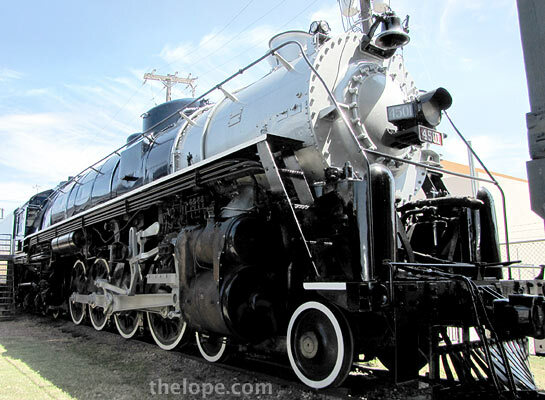 4501 was built by the Baldwin Locomotive Works in 1942 and has a 4-8-4 wheel arrangement. The pump was made by the J.S. Coffin Jr. company of Englewood, New Jersey, which seems to still be in business as Coffin Turbo Pump in Englewood. Here is the other side of 4501. The museum is a cramped place, but plans to spread its impressive collection over a larger piece of real estate next year. Frisco used 4501 for passenger service on its "Meteor" train, which made overnight runs between St. Louis, Tulsa and Oklahoma City. 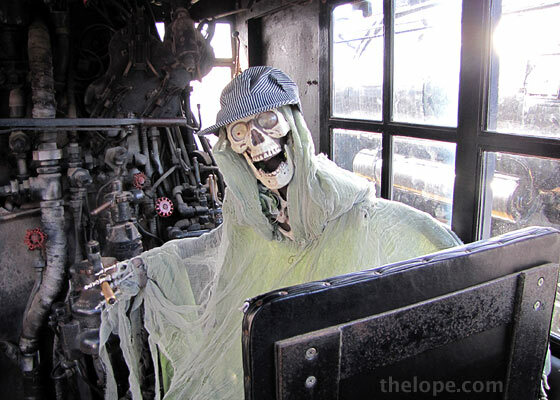 It was delivered in colors of zephyr blue, white and gray, with "Meteor" spelled out on the side of the tender. The "Meteor" lettering is gone but you can see zephyr blue on some of the wheels and cylinders. 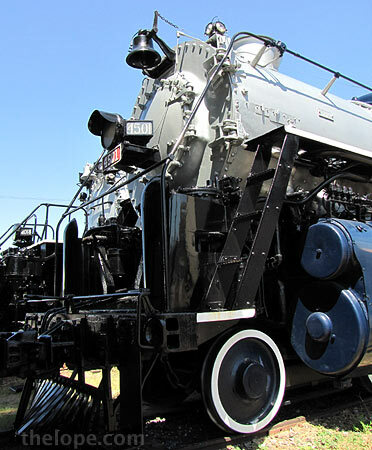 Though its role on the Meteor had been taken in 1947 by diesels, 4501 powered a portion of President Harry S. Truman's 1948 whistle stop campaign through Missouri. The museum thoughtfully provides stairs so you can enter the cab. 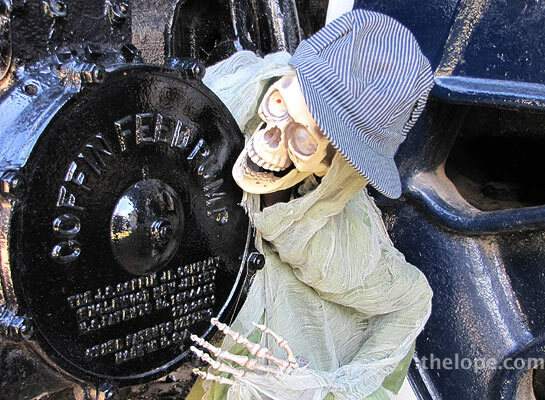 Our fortifying corpse took the engineers seat but was disappointed to find that this locomotive did not have a dead man's pedal - a pedal which when released (as in, when the engineer dies or passes out) would cause a locomotive to stop.